Director – Peyton Reed, Screenplay – Joe Cornish, Adam McKay, Paul Rudd & Edgar Wright, Story – Joe Cornish & Edgar Wright, Based on the Comic-Book Created by Jack Kirby, Stan Lee & Larry Lieber, Producer – Kevin Feige, Photography (3D) – Russell Carpenter, Music – Christophe Beck, Visual Effects Supervisor – Jake Morrison, Visual Effects – capital T, Cinesite (Supervisor – Simon Stanley-Clamp), Double Negative (Supervisor – Alex Wutke), Industrial Light and Magic (Supervisor – Russell Earl), Lola VFX (Supervisor – Trent Claus), Luma Pictures (Senior Supervisor – Daniel Cirelli), Method Studios (Supervisor – Greg Steele) & Trixter (Supervisor – Simone Kraus & Dominik Zimmerle), Special Effects Supervisor – Daniel Sudick, Production Design – Shepherd Frankel & Marcus Rowland. Production Company – Marvel Studios. Scott Lang is released after a stretch in San Quentin Prison for burglary. He tries to slot back into civilian life and see his daughter Cassie but is unable to hold down a job. In desperation, he agrees to take a job breaking into the safe in a retired businessman’s home. He does so but is disappointed to find the only thing in the safe is a suit. Trying the suit on back at home, he is startled when, upon activating it, it shrinks him down to miniature size. He is arrested as he tries to return the suit. In jail, his ‘lawyer’ proves to be Dr Hank Pym, the founder of Pym Technologies, who says that he set everything up so that Scott could steal the suit. He now contrives to have the suit delivered to Scott in his cell so that he can shrink and make an escape. 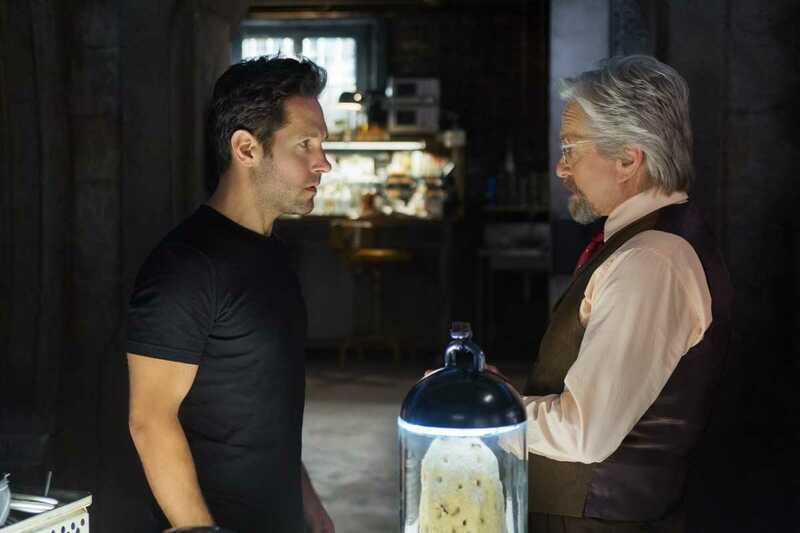 Granting Scott refuge back at his place, Pym reveals that he needs a successor to put on the suit – which he used to wear, operating as Ant-Man for S.H.I.E.L.D.. Darren Cross, Pym’s protege and now the CEO of Pym Tech, is on the verge of discovering the Pym Particle and manufacturing the Yellow Jacket, a series of power-suits that will create an army of miniature soldiers. Pym and his daughter Hope want to break into Pym Tech and sabotage the Yellow Jacket program. To do so, Scott is now required to master the Ant-Man suit and miniaturisation process, as well as the control device that Pym has built that allows mental control over ants. 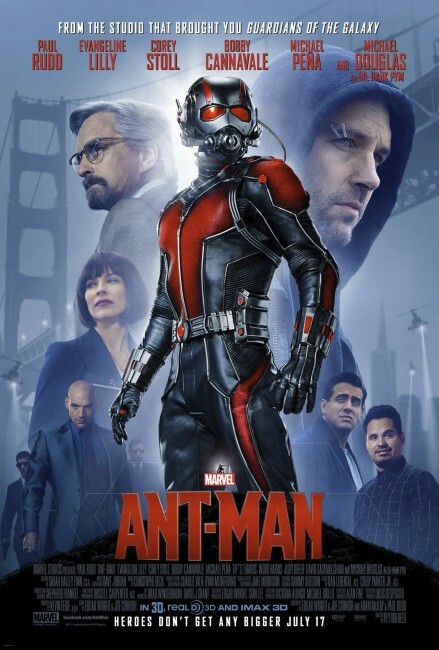 Ant-Man was another in the series of massively popular Marvel Comics big screen adaptations throughout the 2000s/10s that have so far included Blade (1998), X-Men (2000), Spider-Man (2002), Daredevil (2003), Hulk (2003), The Punisher (2004), Elektra (2005), Fantastic Four (2005), Man-Thing (2005), Ghost Rider (2007), Iron Man (2008), Captain America: The First Avenger (2011), Thor (2011), The Avengers (2012), Guardians of the Galaxy (2014), Deadpool (2016), Doctor Strange (2016), Black Panther (2018), Venom (2018), Captain Marvel (2019) and various sequels to most of these, as well as the tv series’ Agents of S.H.I.E.L.D. (2013– ), Daredevil (2015-8), Agent Carter (2015-6), Jessica Jones (2015– ), Luke Cage (2016-8), The Defenders (2017), Inhumans (2017), Iron Fist (2017-8), The Punisher (2017– ) and Runaways (2017– ). Ant-Man is the oddity of the first film in the massive juggernaut of Marvel Comics adaptations to be based on a Marvel superhero who has never actually had his own comic-book. This may say something about how popular the Marvel Comics fad has become that they are now having to reach to B-list characters to generate new properties. The original Ant-Man was Hank Pym who first appeared in Tales to Astonish #27 (1962) where the character’s origin was fairly much that as recounted in the film. What is perhaps less focused on by the film is that Pym’s constant partner was Janet van Dyne who later became his wife and operated as The Wasp and was likewise able to shrink size and sprout a set of wings so that she could fly. Ant-Man and The Wasp were founding members of The Avengers in The Avengers #1 in 1963. Since then, Hank Pym’s history has been all over the place – he variously psychologically snapped, turned against The Avengers, beat up Janet precipitating their divorce in the 1970s and adopted other guises as Giant Man, Goliath and Yellow Jacket (who is incarnated as a separate villain in the film). Pym was also incidentally the creator of Ultron. Scott Lang was introduced as the second Ant Man in 1979 with a background essentially similar to the one we have in the film where he is an electronics expert turned burglar in an effort to try and help his ill daughter Cassie (who later becomes Stature, a shrinking superhero of her own in Young Avengers) and is trained in the use of the suit by Pym. 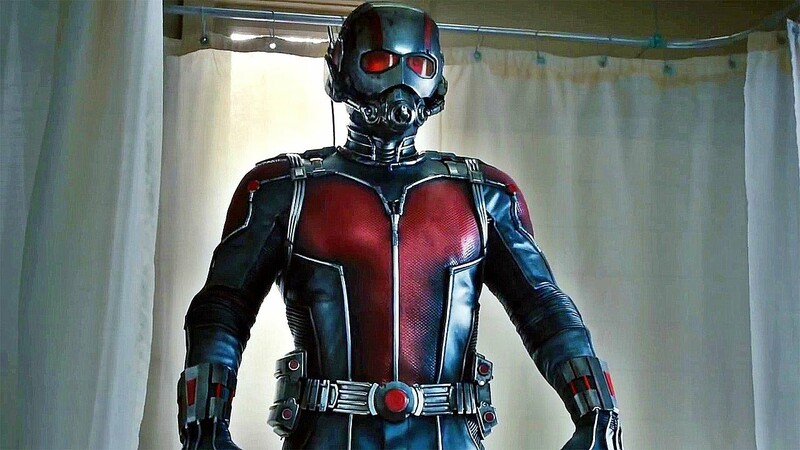 Scott played the role of Ant-Man until he was killed off by The Scarlet Witch in 2004 and the suit was taken over by Eric O’Grady in 2006. Ant-Man has been touted as a potential film project since the 1980s. It gained life during the modern era of Marvel movies under Edgar Wright, the British director of Shaun of the Dead (2004), Hot Fuzz (2007), Scott Pilgrim vs. the World (2010) and The World’s End (2013). Wright developed the script with Joe Cornish, the director of Attack the Block (2011) and Wright’s co-writer on Steven Spielberg’s The Adventures of Tintin (2011). Wright and Cornish developed several drafts of the script where they decided to focus on Scott Lang mainly because he had a less complicated storyline than Hank Pym. Wright spent some time on the project, which was being mentioned as long ago as the time that Shaun of the Dead was in release – it was he who cast Paul Rudd, Michael Douglas and Evangeline Lilly in the roles. However, in mid-2014, it was announced that Wright was departing over “creative differences.” Details about what happened are scanty but it would seem to be that Wright’s vision and more comedic focus conflicted with Marvel’s continuity harmonisation project. The quick announcement of Peyton Reed as replacement director did not exactly give a huge amount of hope. Reed had made his name in romcoms like Down With Love (2003) and The Break-Up (2006) and his biggest hit up to this point had been the Jim Carrey comedy Yes Man (2008). The most work Reed had done in genre material had been directing Disney tv movie remakes of their classics with The Computer Wore Tennis Shoes (1995) and The Love Bug (1997), although he was for a time originally attached to direct the 2005 Fantastic Four. Usually the last minute/mid-film replacement of a director spells a disaster but the good news is that Ant-Man emerges as better than one expected it to. You suspect that Edgar Wright’s Ant-Man would have come out as something more akin to Guardians of the Galaxy but Peyton Reed delivers an amiably middle-of-the-road effort, something that is lightweight but sufficiently engaging. This is not a film that you suspect is going to break all box-office records in the way that the various Avengers films did. Part of this is the way it is conceived. It seems less a superhero film than a caper comedy where the story arc is the redemption of a typical down-and-out character. The superheroics come more towards the end but even then they are more big-and-small effects in the vein of The Incredible Shrinking Man (1957), which is clearly referenced in the scene with Paul Rudd shrinks down to sub-atomic size, Honey, I Shrunk the Kids (1989) and tv’s Land of the Giants (1968-70) than the sort of massively scaled superheroic battles you get in the other Marvel films. (This is part of the reason one suspects that Ant-Man and DC’s The Atom, who was the original inspiration for Ant-Man, having appeared two decades earlier, have not exactly been A-listers in either company’s superhero pantheon). Peyton Reed compensates fairly well. Paul Rudd, Michael Douglas and Evangeline Lilly, almost unrecognisable behind an unconvincing black wig, slot together and play off one another well and it is their humour that makes the film. The scenes with the training and taming of the ants work reasonably well and the film builds up to a suitably well scaled break-in sequence and a climactic showdown with Corey Stoll’s villain. The most amusing of these sequences is the battle that takes place in Abby Ryder Fortson’s bedroom where the fight between Rudd and Stoll on a toy model train track contrasts superheroic feats with either lifting carriages above their head and tossing them around with pullbacks to normal-size showing the trains feebly falling over, or of ants and a Thomas the Tank Engine carriage bursting out of the house expanded to giant size. There are all the requisite pieces of fanservice tying up with the rest of the Marvel Universe. Anthony Mackie has a substantial part as The Falcon, while Hayley Atwell reprises Peggy Carter and John Slattery the aging Howard Stark that the digitally altered younger Michael Douglas meets in the opening scenes set in 1986. There are also various namedrops to The Avengers and Iron Man, as well as to Pym’s past as a S.H.I.E.L.D. operative and one flashback scene with he and The Wasp in action. There are two post-credits sequences – one where Michael Douglas introduces Evangeline Lilly to a redesigned Wasp suit with the implication being that she will put it on; and another as set-up for Captain America: Civil War (2016) featuring Anthony Mackie, Chris Evans and an imprisoned Bucky with cryptically meaningful dialogue about keeping Tony Stark out of it and Mackie stating that he knows who the right person for the job is. Ant-Man and the Wasp (2018) was a sequel featuring the return of Peyton Reed, Paul Rudd, Evangeline Lilly and Michael Douglas. Ant Man also joined The Avengers in Captain America: Civil War (2016).